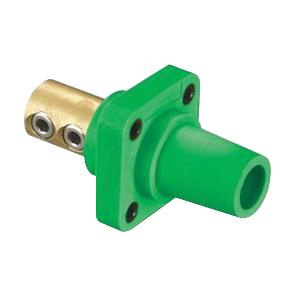 Hubbell-Wiring Insulgrip® Series-16 1-Pole Female receptacle in green color, accommodates conductor of size 4 - 4/0-AWG. It measures 4.1-Inch x 2.2-Inch x 2.2-Inch. Receptacle features thermoplastic elastomer construction. It has voltage rating of 600-Volt AC/250-Volt DC and current rating of 400-Amps. This receptacle has threaded mounting holes for quick installations. Brass contact ensures better electrical conductivity. It has non-metallic safety retaining screw for secure installation. It provides double set screw connection. It supports panel mounting. NEMA 3R/4X/12K receptacle is compatible with 300-Amp plugs and 400-Amp plugs. Receptacle is UL/cUL listed.